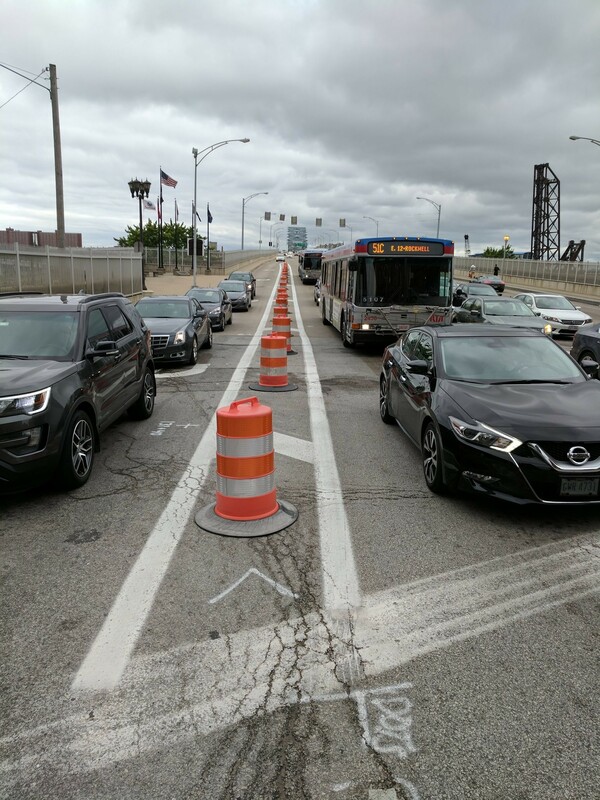 After some hubbub on Twitter about the appearance of orange barrels in the bike lane on the Detroit-Superior Bridge, Bike Cleveland managed to get an explanation from Cleveland's visionary traffic engineer, Andy Cross. "You are correct about this being a priority bike route into downtown," Cross wrote in an email to Bike Cleveland. "Unfortunately, the large work zone on W. Superior Avenue between W. 6th Street and W. 9th Street only maintains one lane of eastbound traffic to the east of the Detroit-Superior Bridge. 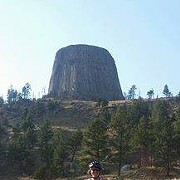 For the safety of cyclists, we had to close the bike lane. Had we kept the bike lane open, cyclists would be forced to abruptly and dangerously merge into mixed traffic while crossing W. Huron Road. "The traffic control plan for this work zone does include numerous shared lane symbols," Cross continued. "They will be centered within the one eastbound lane that remains. The construction drums you see only are temporary; they will remain in place until the contractor gets favorable weather to resume the striping work. Note that when the drums are removed, the bike lane still will be closed. 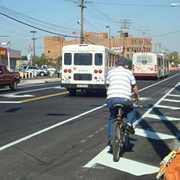 Paint will indicate that area is no longer open for bicycle traffic." 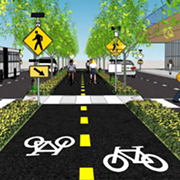 Bike Cleveland agreed with this assessment: "The orange barrels (and the chevrons to come) make sense," the organization said. "The bike lane would cause riders to get ‘pinched’ as they meet the tight single lane after crossing Huron.